Season 2, Episode 43 - In Memory of Joshua Casteel (Dec. 1979-Aug. 2012) Tommy​ and I are honored to present this special episode in memory of the life of Joshua Casteel. Joshua was a classmate of ours at Washington High School in Cedar Rapids, Iowa. We're honored to have Joshua's mother, Kristi Casteel, join us on The Curiosity Hour Podcast to talk to us about her son's life. Joshua Casteel was a United States Army soldier, conscientious objector, writer, playwright, and divinity student. He was born in Sioux Falls, South Dakota and raised in Cedar Rapids, Iowa in a Christian Evangelical family to parents Rick and Kristi Casteel. While Joshua displayed early interest and skills in various arenas, including sports, music, theater, writing, and academics he chose to follow in the footsteps of his grandfather and father by attending West Point Military Academy. From his first experience with military life, questions began to surface as to whether he was ‘a fit’ for military life and philosophy. After much deliberation, he realized he decided he needed to leave West Point. He enrolled at the University of Iowa and graduated with honors with a multidisciplinary major in Literature and the Arts with an emphasis in Philosophy. After 9-11, he felt he was constrained to fulfill his initial military commitment. He served with the Army's 202nd Defense Battalion as an interrogator at the Abu Ghraib Prison in Iraq, arriving six weeks after revelation of prisoner abuses by US personnel at the prison. After spending six months in Iraq and experiencing the realities of war and violence first hand, all the while struggling with the ethical and theological questions pertaining to his job and identity as a Christian soldier his military career finally came to an end. Years of study, counsel, prayer, and first hand experience ultimately led him to apply for conscientious objector. The Army approved his application and granted him an honorable discharge in 2005. Joshua went on to graduate from the University of Iowa in 2008 with a dual Master of Fine Arts Degree in playwriting and non-fiction writing. He was an active member of Iraq Veterans Against the War and the author of several plays performed in the US and abroad, including Returns and The Interrogation Room. His play will be performed as an opera in the UK in 2018. During the seven years between his return from Iraq and his death, he was featured writer for several magazines and a public speaker on religious and political matters around the world. He was featured in the documentary films Iraq For Sale: War Profiteers and Soldiers of Conscience. Excerpts of Casteel's emails from Iraq were published in Harper's Magazine and in book form by Essay Press, entitled Letters From Abu Ghraib. A second edition was published by Wipf and Stock Publishing in July, 2017. Prior to his death Joshua was at work on his memoir entitled, No Graven Image. He was attending the Divinity School at the University of Chicago at the time of his diagnosis. Before he died he was honored for his work towards justice and peace. Joshua died of lung cancer in New York City in New York Presbyterian Hospital on August 25, 2012. 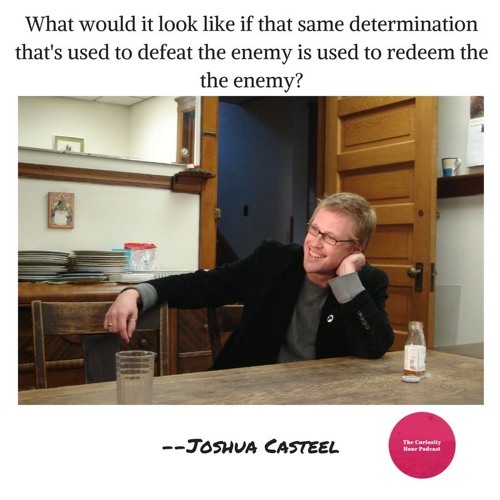 The Joshua Casteel Foundation was formed to carry on his legacy of nonviolence, working towards peace, justice and reconciliation in the world in ways that respect and honor the value of human life. Website (check after December 1, 2017): http://joshuacasteel.com Special thanks to Kristi Casteel, Rebekah Casteel Latchis, Naomi Casteel Thompson, Erin Gullickson, Christopher Merrill, Chad Nicholson, Shawn T. Storer, Rachel Swanson Hillestad,Cory Thompson, Jeffrey J. Weiss. Special thanks to Gary Weimberg and Catherine Ryan for permission to use excerpts from Soldiers of Conscience by Luna Productions (http://lunaproductions.com/soldiers-of-conscience-the-movie/) The Curiosity Hour Podcast is hosted and produced by Dan Sterenchuk and Tommy Estlund.